Please get in touch in order to make an appointment. Phone Francis on 087 9736417 (Mon to Fri). Click here to email. Phone Ger on 086 6090273 (Wed & Thurs). Click here to email. 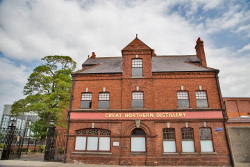 We are located at the Cherrywood Counselling Centre, Great Northern Distillery Building, Carrick Road, Dundalk. It is right beside the town's railway station and all of its excellent amenities. See here for a map.